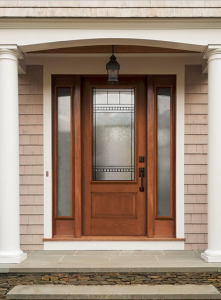 Are you looking for a new entry door? Consider fiberglass doors! Fiberglass Doors give you the look of wood without the cost or maintenance. In manufacturing fiberglass doors they have the “skin” molded into one big contiguous sheet so the parts and pieces can’t separate. This is also beneficial so water cant get inside and cause problems unlike real wood doors. Fiberglass doors are also great for insulation and do not let any moisture in which will affect door performance and durability. The fiberglass doors are filled with polyurethane foam which is also great for insulation. When choosing a fiberglass door you can also choose a colour, such as, mahogany, country style and oak. You can also customize the door with a shelf, panels, and sidelites. Contact us for more information or book a free estimate online.